Distributed By – Scorpio Music, Inc.
℗ 1976 SIRE RECORDS, INC.
Also issued on high quality colored vinyl (with same catalogue number). Matrix / Runout (Side A Etched Runout): SASD7520 S-57541 SC01-6020-A RAMONES "RAMONES"
Matrix / Runout (Side B Etched Runout): SASD7520 S-57542 SC01-6020-B RAMONES "RAMONES"
I dig the symmetry of sound, that's for sure. 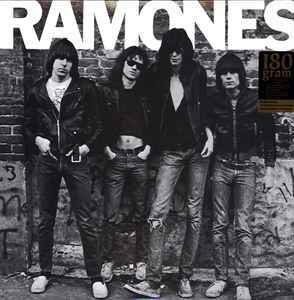 If you're unaware of The Ramones impact, both musically and aesthetically, you've been the rare Mormon bird shut away tightly in a cage at the bottom of some deep clear blue in Salt Lake City. If punk is a religion, this is the bible.